In order to address the declining labor force problem in Japan, certain activities called “Diversity Management” are now being promoted by the Japanese government. In these activities, many enterprises have adopted Diversity Management for innovation and improvement in productivity by utilizing various human resources including women, people from overseas, the elderly, and people with disabilities. One of the main themes in diversity management, especially in the growth period of enterprise, has been the promotion of female employees and temporary workers including those who are of younger age and elderly. Some unexpected accidents have been occasionally reported, which have been caused by cultural differences or differences of values. Under these circumstances, notices such as a checklist of safety points and information of incident reports have been provided for enterprises promoting Diversity Management, especially in the case of younger temporary workers and female temporary workers who have burdens of house-holdings. Also, an internet questionnaire was performed on parents’ anxiety in variable risks including nuclear radiation risk, after the accident of Fukushima Daiichi Nuclear Power Plant, 2011 (n = 1500, performed in 2018). Some trends of career choice were revealed in the influence to children’s future: the anxiety of parents who have children of elementary school were highest among other groups. These trends may affect their career promotion and decline job-motivation or the feeling of job-satisfaction. Some countermeasures in the viewpoint of life-career balance should be prepared in the case of over-anxiety. This work was supported by JSPS KAKENHI Numbers 16K01879 (Grant-in-Aid for Scientific Research (C)). The former part of this work, especially about statistics and notices about Diversity Management, were also reported on the article, reference no. 2. 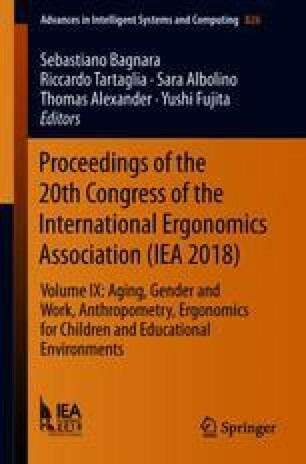 A part of this study was presented at the 49th annual conference the Japanese Ergonomics Society, 2018.